I read an article recently about how "Mom Brain" is a real thing. If you have children and have never had mom brain, first, I want to know your secret. Second, you're probably a mutant, so expect a call from Professor X about joining an elite team of super-humans. Also, you're a jerk and I hate you. With a six-week old and a toddler, along with a husband who travels for work, I'm burning the candle at both ends these days. Sleep and I are in a huge fight right now, and unfortunately, I'm losing. I can't correctly identify the most basic objects (carseat, highchair, stroller, booster chair...these are all interchangeable, as are drawer, cabinet, cupboard, counter, and closet). The words "left" and "right" have absolutely no meaning (though, in fairness, I've always struggled with these (in English, not French, oddly)). Yet I can recite nearly every children's book we have by memory. I can tell you exactly where every article of clothing and pair of shoes are in our house. I can rattle off our pediatrician's number as easily as the number for poison control (heh heh...). So, you know, that makes sense, Brain. And you know the best part is about Mom Brain? I have no idea what the point of this post is. Oh, good. I'm glad it's not just me. Each pregnancy takes away brain cells, I swear. Then we mix up names of our children. I blame sleep deprivation and multitasking. I had mom brain posting the first comment that I deleted. I forgot to click Notify me. 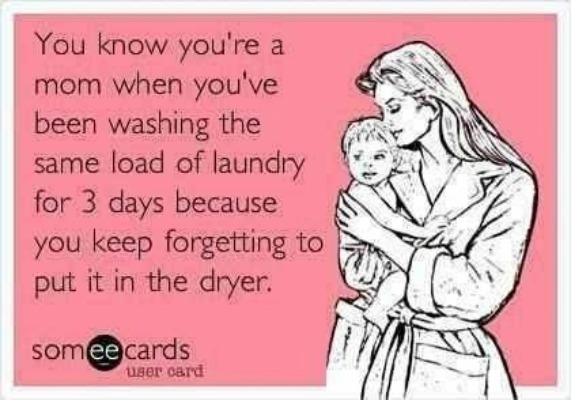 Ah, mom brain. great badge! HAHA! So true! I've done thin several times!